When load testing web applications, I usually take a few URLs and run them through tools such as Apache Bench (ab) or more recently, Siege. Recently, however, I needed to compare performance under load for code querying data from a MySQL database table versus a Lucene index. I could have built a simple web-based interface around this code and used the tools mentioned above, but it seemed like too much work, so I looked around to see if there was anything in library form that I could use to load test Java components. The first result on my Google search came up with information about Mike Clark's JUnitPerf project, which consists of a set of Test decorators designed to work with JUnit 3.x. Since I use JUnit 4.x, I would have to write JUnit 3.x style code and run it under JUnit 4.x, which is something I'd rather not do unless really, really have to. That was not the biggest problem, however. Since both my components depended on external resources, they would have to be pre-instantiated for the test times to be realistic. Since JUnitPerf wraps an existing Test, which then runs within the JUnitRunner, the instantiation would have to be done either within the @Test or @Before equivalent methods, or I would have to write another @BeforeClass style JUnit 3.8 decorator. In the first two cases, tests run with JUnitPerf's LoadTest would include the resource setup times. So I decided to write my own little framework which was JUnit-agnostic and yet runnable from within Junit 4.x, and which allowed me to setup resources outside the code being tested. My framework borrows the idea of using the Decorator pattern from JUnitPerf. It consists of 2 interfaces and 5 different Test Decorator implementations, and couple of utility classes. The only dependencies are Java 1.5+, commons-lang, commons-math, commons-logging and log4j. I call it jab (JAva Bench), drawing inspiration for the name from Apache Bench. It can also be thought of as something that inflicts pain on your Java application by putting it under load (hence the title of this post). The ITestable interface provides the template which a peice of code that wishes to be tested with jab needs to implement. The resources argument passes in all the pre-instantiated resources that are needed by the ITestable to execute. Further down, I show you a real-life example, which incidentally was also the code that drove the building of this framework - there are two example implementations of ITestable in there. ITest is the interface that all our Test instances implement. This is really something internal to the framework, providing a template for people writing new Test implementations. This is the most basic (and central) implementation of ITest. All it does is wrap the ITestable.execute() call within two calls to System.currentTimeMillis() to grab the wallclock times, and calculate and update the elapsed times into the appropriate counters. This is the only ITest implementation that has access to the ITestable. More complex ITest implementations wrap a SingleTest. Instantiating a SingleTest is simple. The example below shows it being instantiated with an ITestable implementation called MockTestable. Most of the values are self explanatory, corresponding to various common statistical measures. The FAILED and SUCCEEDED signals that the number of the failures and successful runs should be counted and aggregated. The Aggregator provides utility methods to actually do the aggregation that is requested using the AggregationPolicy. We rely on the StatUtils class in commons-math to do the heavy lifting. * based on the specified aggregation policy. A RepeatedTest decorates an ITest, usually a SingleTest. All it does is run the decorated ITest a specified number of times, collecting and aggregating the elapsed time observations. The type of aggregation is specified with an AggregationPolicy. The default AggregationPolicy is AVERAGE, meaning that the aggregated observation is the average of the individual aggregated observations from the ITests. As you can see, there three constructors that you can use. The simplest one specifies the ITest and the number of repetitions, the second one overrides the default AggregationPolicy to be used, and the third one specifies that the test should wait a specified number of milliseconds between ITest invocations. Here are some usage examples. A ConcurrentTest decorates an ITest and runs a specific number of these ITests concurrently. Like RepeatedTest, its default AggregationPolicy is AVERAGE, which can be overriden. Also like RepeatedTest, it allows you to specify a delay between spawning successive parallel ITest instances. * Models multiple running concurrent jobs. A TimedTest is passed a ITest and a maximum allowed time. The underlying ITest is allowed to run to completion, and if the aggregated observation exceeds the maximum allowed time, it is recorded as a failure. * that period, it is counted as a failure. // 10ms, and count the number of failures. This test measures the througput, i.e. the number of times the test ran within the maximum allowed time period. This is useful when you want to stress test a component for a given time period, say 10mins, and see how many times it ran. * the test was run in the time provided. And here is an example of how to call this. As you can see, you can nest decorators fairly deep, although it is left to you to determine what kind of nesting make sense. I tested the code above with a MockTestable that slept for 10s to simulate some kind of load. But the whole reason I built this was so I could do this sort of thing on real-life components. Here is a JUnit test that runs searches against 2 components and compares their performance under load. The searchers are modeled as ITest implementations. As you can see, these two testables are just some simple code to run an SQL query against a database table and a TermQuery against a Lucene index. All the expensive resources (and some inexpensive ones) are passed to the ITestable via the resources map. The resources are created in the calling JUnit test, which also uses the jab mini-framework to build a pair of progressively larger ConcurrentTest by varying the number of users. Each ConcurrentTest is composed of 10 RepeatedTest, which invoke one of the two ITestables shown above. The observations from each run are aggregated and written out into a flat file in tab-delimited format. Here is the code for the JUnit test. * Harness to compare Lucene and MySQL cp index performance. Although the results of this exercise is not relevant for this post (since I am just describing the framework and how to use it), I thought it would be interesting, so I am including it here. 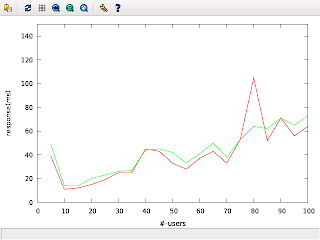 To visualize the data, I used the following gnuplot script to transform the average time observations into a graph. The graph is shown below. Not too many surprises here, there are quite a few people who've reached the same conclusion, that it is as performant, and often more convenient, to serve results of exact queries from a MySQL database than from a Lucene index. Prior to this, I would either resort to wrapping a component in a web interface and used ab or siege, or written JUnit tests that did the multithreading inline with the code being tested. I think this approach is cleaner and perhaps more scalable, since it separates out the component being tested from the actual test parameters, allowing you to model more complex scenarios. I am curious as to what other people do in similar situations. If you have had similar needs, I would appreciate knowing how you approached it. I am also curious if other people think this is complete enough to release as a project - I don't really want the headache of maintaining and improving the project, I just figure that it may be useful to have it somewhere where people can download it, use and maybe improve it and check the fixes/features back in. Also, I don't normally write multi-threaded code, just because its not needed that often for the stuff I work on, so there may be obvious bugs that a reader who does multi-threaded stuff for a living (and some that do not) may spot immediately. If so, please let me know and I will make the necessary corrections. Another very interesting article -- I stumbled on this one while searching for pattern examples. I understand most of the patterns but have trouble visualizing the patterns in my projects sometimes. It would be great if you can post some posts on the design patterns you used in your projects -- it is easier to learn by examples! Thanks again, Satish. I'm not sure about the idea of me writing about patterns though, I think the GoF Book has done a very good job already :-). Also, like you, I often apply patterns by instinct rather than by conscious thought.